("Why should the law refuse its protection to any sensitive being? The time will come when humanity will extend its mantle over everything which breathes." - Principles of Penal Law. From the French of Dumont and the MSS of Bentham. Part III. Chapter XVI Of the Cultivation of Benevolence. p. 562 Google Books, in: Works, now first collected under the superintendence of John Bowring. Part II. Edinburgh-London-Dublin 1838. Commons führt Medien zu Jeremy Bentham. 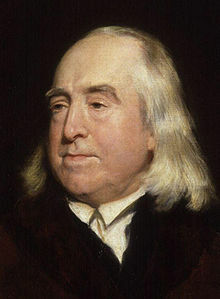 Wikiversity behandelt das Thema Philosophie und Philosophen des Glücks#Jeremy Bentham. Diese Seite wurde zuletzt am 9. April 2014 um 21:47 Uhr bearbeitet.